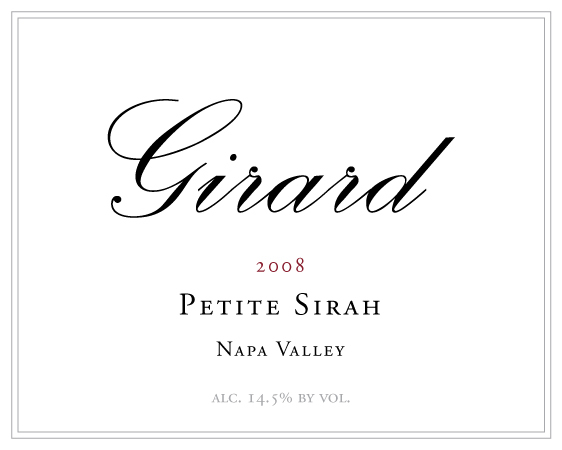 EXQUISITE: 2008 Girard Petite Sirah (89% Petite Sirah, 8% Zinfandel, 2% Mourvedre, 1% Grenache), Napa Valley. $22-30, available for as little as $17.99. 14.5% ABV. It shows brilliant and clear: ruby/garnet with pink edges, (temporarily) glass-staining pink legs, and wine crystals. Anyhow, it’s full-bodied, powerful, expressive, and bright, with aromas of cherry, plum, and baking spices. Just delicious with cherry, black fruits, and a little cedar. Despite its power, it is simultaneously soft, with a mildly spicy and lingering finish. Fermented in steel, it was barrel aged in both American (25%) and French (75%) oak, which further explains the complexity and elegant, tightly woven structure. LABEL NOTES: Our old vine Petite Sirah is a massively intense wine with inky jet blue and ruby red colors. The aroma is packed with blueberry, coffee, black cherry and lilac. The intense flavors are followed by a rich, complex middle and a silky smooth finish. WINERY NOTES: Our 2008 vintage Petite Sirah is an inky, dark, fruit-forward wine with aromas of baked cherry pie, ripe plum, marzipan, anise and allspice; on the palate, there’s a wonderful balance of integrated, firm tannins and crisp acidity with a soft, spicy and lingering finish. The blend is 89% Petite Sirah, 8% Zinfandel, 2% Mourvedre and 1% Grenache. Total cases produced: 5,200. This entry was posted in California, Grenache/Garnacha, Mourvedre, Petite Sirah, Zinfandel. Bookmark the permalink.